The thalamus functions as an anatomical region of the brain, located in the center of the brain, between the cerebral cortex and the midbrain. 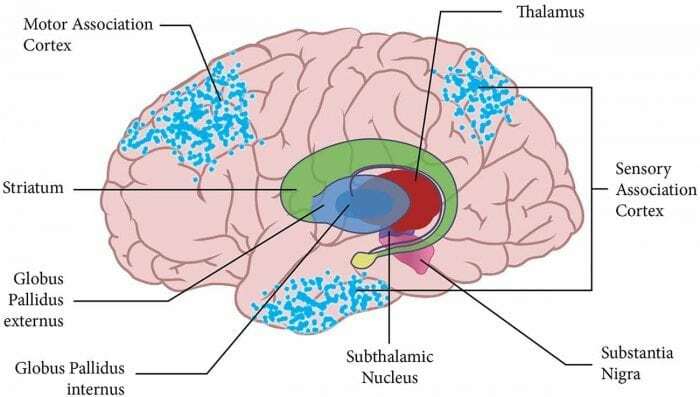 The thalamus is involved in several cognitive functions, such as serving as a central hub to relay sensory information to the brain, regulating sleep and consciousness, and the regulation of anger and aggression. Like most areas of the brain, the thalamus is multifunctional in nature so it handles a number of different cognitive processes. The first person to describe the thalamus was the Greek physician Galen in antiquity. Galen named the organ thalamos after the Greek word for “storeroom” as he believed that the thalamus contained the vital spirits that traveled down the optic nerve to the eye and allowed for sight. The connection between the thalamus and the sense of sight remained for centuries, as is evident in the French name for the region “couche optique” (literally: “seeing thing”). It was not until around the 18th century that physicians realized through clinical observation the multisensory nature of the thalamus, as patients with lesions in that brain area showed diminished sensory capacities. The invention of the microscope in the early 19th century saw an explosion of anatomical research on parts of the brain, including the thalamus. The introduction of sophisticated cell staining techniques showed physicians that the thalamus shared cortical connections with every region of the brain, thus furthering the case that the thalamus is involved in multi-sensory integration. 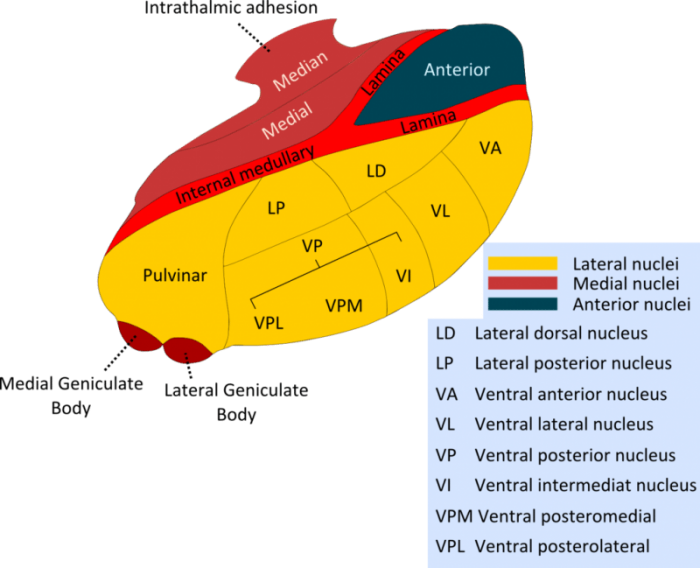 It was also discovered that the thalamus itself was further divided into smaller specialized anatomical regions, regions that are each associated with a particular sensory system. Galen’s posited connection between the thalamus and the sense of sight is in many ways still correct. Although he got specific details wrong, it is true that the thalamus plays a role in relaying the contents of vision to the right area. Information from the retina is sent to the thalamus, specifically the lateral geniculate nucleus, which then relays that information to the visual cortex in the occipital lobe. What Galen was wrong about though was that the thalamus is not only associated with the sense of sight. In fact, every sensory system (except the olfactory system) relays its information through the thalamus, giving the thalamus the role of the main sensory information relay hub of the brain. Information from sensory systems is sent to the thalamus, then the specific thalamic nuclei relay that signal to the appropriate area of the brain. For example, the medial geniculate nucleus plays a role in relaying auditory information to the auditory cortex in the temporal lobe, while the ventral posterior nucleus relays somatosensory information to the sensory cortex in the parietal lobe. It is thought that the thalamus serves to process sensory information too, as it shares strong feedback connections with the cerebral cortex. The thalamus is also thought to play an important role in the regulation of sleep and wakefulness. When asleep, the thalamus suppresses the relay of information to the sensory-motor cortex through a process known as GABA-mediated inhibition. GABA neurotransmitters bind to the neuron and inhibit its action potential, so they neuron is less likely to fire and excite neighbor neurons. The result is that less information is sent to the sensory-motor cortex, allowing one to not be awakened. This role of the thalamus is most clearly seen in patients with pathologies related to the thalamus, Damage to the thalamus can lead to sleep disorders like insomnia and an inability to regulate parts of the endocrine system. 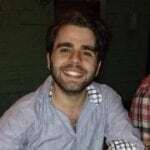 Fatal familial insomnia is a particularly nasty hereditary prion disease in which degradation of the thalamus leads to a permanent inability to sleep and eventually death. Additionally, some researchers theorize that the thalamus is an integral part of consciousness in human beings. Llinás et. al (1998) present a model in which thalamocortical circuits, feedback mechanisms of neural tissue between the cerebral cortex and the thalamus, allow the brain to gain reflective knowledge about the activity of its own cerebral cortex. Information from the cerebral cortex is sent back to the thalamus which is then reprocessed and distributed to the brain. The regulation of these information feedback mechanisms is identical to our conscious experience; the subjective experience of knowing the contents of one’s own mind. 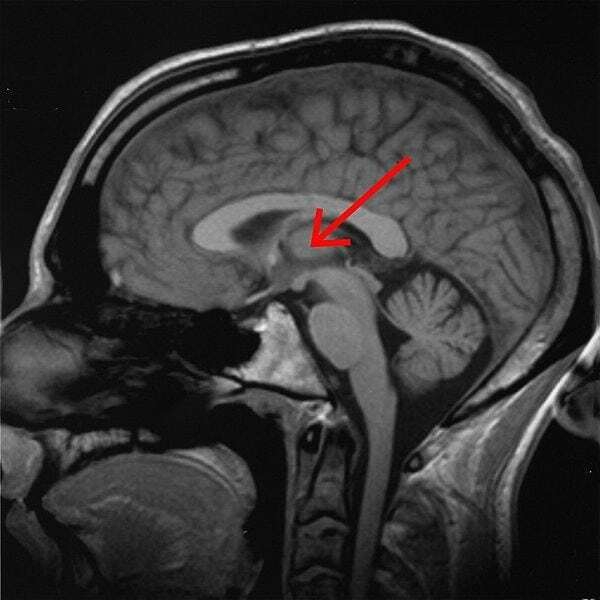 There is also a substantial amount of evidence that associates damage to the thalamus with severe disorders of consciousness such as permanent comas or persistent vegetative states, indicating that the thalamus likely plays a role in regulating general conscious awareness. Likewise, there is also evidence that the thalamus coordinates more general cognitive processes related to working memory and executive decision making. In the reported study, scientists found that direct stimulation of the mediodorsal thalamic region in mice resulted in a 25% percent decrease in error on subsequent cognitive tasks. The authors hypothesize that the stimulation of the thalamus promotes the creation of neural circuits, which can be used for quick and accurate decision making. In sense, stimulating the thalamus “supercharges” the connections between the thalamus and other parts of the brain, making them work faster and more efficiently. Perhaps ironically, the researchers also found that increased stimulation of the pre-frontal cortex, the area of the brain most commonly associated with executive decision making, actually led to an increase in errors when performing cognitive tasks. The researchers believe that the increased pre-frontal activity “overloads” neural decision-making circuits, causing conflicting rule sets to fire at the same time. These findings suggest that the thalamus plays a role in regulating general attention mechanisms that allow us to focus on one cognitive representation over another. Incidentally, some neuroscientists think that the dual thalamic functions of regulating attention and consciousness are closely related, as consciousness is just a particular form of attention.